Dr. Kavita Rajdev has completed her BDS from the SPDC college of The Deemed University of Datta Meghe Institute of Medical Sciences in the year 1998. She has extensive experience in all aspects of clinical and aesthetic dentistry for over 18 years. She moved to United States in the year 2005 and pursued a fellowship in Implant dentistry at the prestigious University of Birmingham, Alabama, USA where she worked as a faculty and planned and developed, a state of the art Dental Implant facility, mentored by Dr. Michael McCracken in the Department of Prosthetic Dentistry. She then continued to pursue her clinical practice in the city of New York, USA. 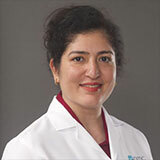 Dr. Kavita returned to India in 2007 following which she has been active in dental practice across the entire spectrum of mass and class practice. She worked as a Consultant in Dentistry in a tertiary care medical centre, 1500 bed hospital Seven Hills in Mumbai, India. She also holds a hospital management degree (PGDHHMS) from the Indira Gandhi University in year 2013. Her keen interests are in root canal therapy, aesthetic dentistry, and almost all types of general dental care. She can speak in English, Hindi, Sindhi and Gujarati.